Kikas Babenco and Marmaduke Arado, call themselves The Wearers and have developed a show called “The Extraordinary Adventures of Kikas & Marmaduke” – a succession of scenes from a hypothetical 3D cartoon telling the wacky trials and tribulations of their avatars in Second Life. 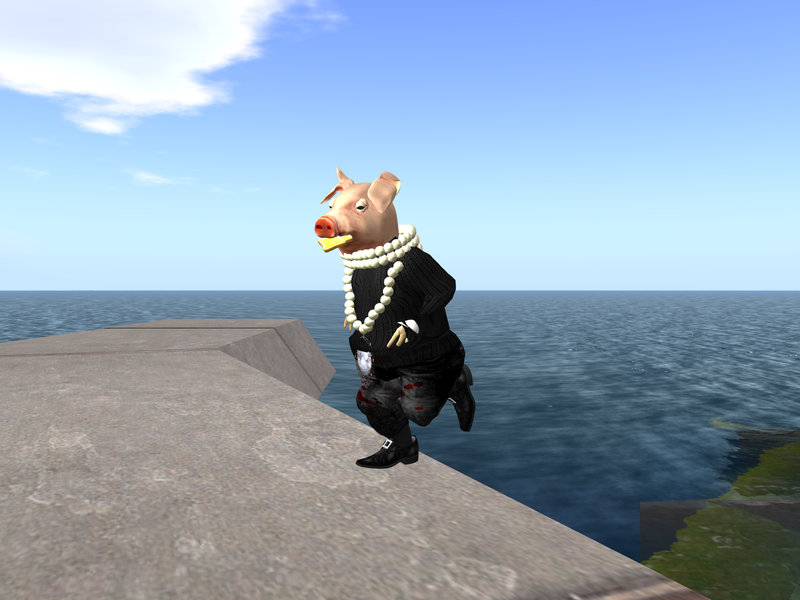 “The Extraordinary Adventures of Kikas & Marmaduke” aims to be fun while it explores the possibilities of Second Life itself as a creative medium. This mixed reality participatory performance will involve Movement/Dance and Sound/Music Improvisation, amongst physical bodies, and physical bodies and avatars. Keyboard-free alternative modes of embodied interfacing will be enabled by video livestream in SL of the physical participants at Betone, NZ, and, possibly, Tokyo, Japan, Webcam and Wiimote interfacing (software objects to be shared) for physical and remote participants. Senses Places continues the ongoing experimental dance-technology collaborative research work from Real Virtual Games through Weathering In, towards critically expanding kinesthetic/synesthetic perceptions and communication, engaging physical and physical-virtual Contact and Somatic Movement based Improvisation, Sound, and body-environment climate interactions. We focus on challenging choreographic/designed/devised relationships amongst participants, with/through mediated doubles (video image and/or avatar), and with aspects of the responsive environment, which would benefit, enrich, bringing agency to embodied subjects within a post-human corporeal condition. Come one, come all and compete in the first ever AVATAR WRESTLING FEDERATION SMACKTACULAR! Good guys, bad guys and all characters in between earn bragging rights at this “spectacle of excess” unparalleled in any life and not possible in real life! Join avatars from communities from all over Second Life to come together for a festival of absurd creative competition and over-the-top artistic performance and entertainment. At this event the winner takes it all. Featuring routines by the Second Life Cheerleading Squad. Started in 2007 by Christi Charron, the SLCS has blossomed into the largest and most successful Cheerleading groups within Second Life. A ritual of initiation and purification is needed; an encounter with the operator that every avatar has. Whether you believe in them or not, they rule our destiny. A communication channel will be opened with one of them. Are there any messages for us out there? MASS.LIVE.NU performance is a modest comment on some of today’s global issues and an attempt to predict a future where cyber migration becomes an issue when geopolitical borders prevent migration of people seeking happiness. “Lag-Hell on Earth”.